I hail from a charming little mining town called Kolar Gold Fields, in the erstwhile Mysore State, now a part of Karnataka. I was born into a well-known Anglo-Indian family in KGF, tracing our roots back to British, Portuguese and Dutch ancestry. The Kolar Gold Mines were owned and operated by the British mining firm of John Taylor & Sons for almost a century. Four generations of my family lived and worked in the KGF Mines. The town had an old-world bonhomie about it, and was known for its affectionate and warm people. It was unique in its secular and egalitarian society. KGF was known as ‘Little England’ due to its colonial ambience, and European and Anglo-Indian population. Our lives were greatly influenced by the culture and ways of the Raj. There was no dearth of British goods in the 1940s and 50s. Goods were imported from England and sold through The English Ware House, Spencer’s Stores and various clubs in KGF. For as long as I can remember, there was always a good supply of Kraft Cheese, Tuna Fish, Polson’s Butter, Colman’s Mustard, Sardines, Baked Beans, Jams, Jellies and Quaker Oats, in our home. A recipe book from the early 20th Century, handed down to Bridget from her mother. 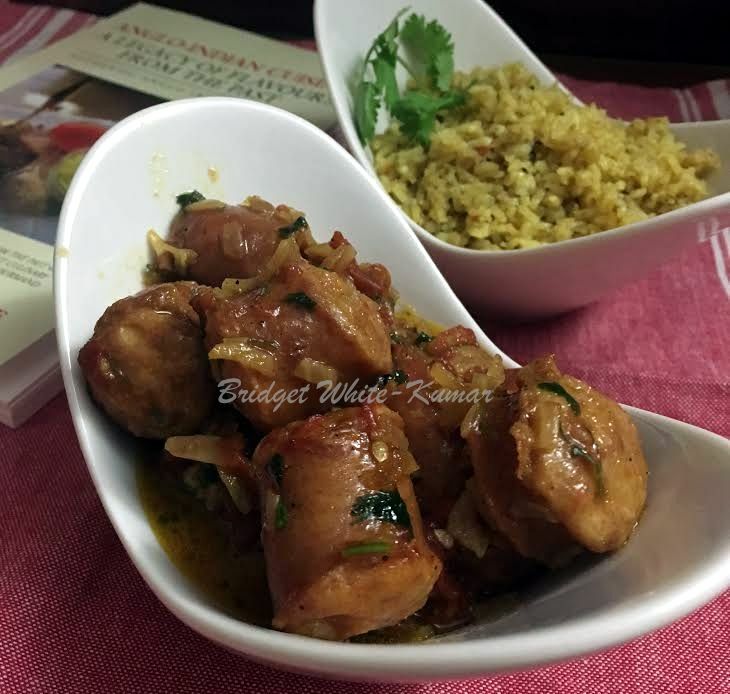 In order to get the authentic and well remembered taste of Grandma’s Anglo-Indian Curries and Side dishes, it is always advisable to use only the right ingredients that are called for in the recipe. The secret of good, tasty cooking is the right proportion of ingredients that are to be used in cooking a particular dish. While preparing any dish, a perfectly balanced mix of the various ingredients should be maintained since adding even a little more or less can ruin it. Another important aspect is to extract the correct strength of a spice and never overstate it. It is always advisable, to use good quality condiments and spices. Anglo-Indian Cooking specifically makes use of these commonly available ingredients: namely chillies, cumin, pepper, turmeric, coriander (either whole or in powder form) and whole spices. So ensure that the expiry date has not lapsed while shopping for these ingredients. As far as possible use ginger and garlic paste that is ground at home in a blender using fresh root ginger and garlic. The readymade ginger and garlic paste available in stores around the world contain vinegar / acetic acid and other preservatives. These detract from the original taste of the Curry giving it a completely different flavour. 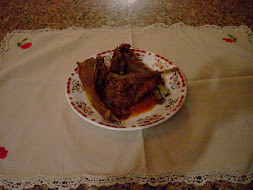 If fresh homemade ginger and garlic paste is not available, then Garlic Powder could be used instead of fresh garlic. One teaspoon of garlic powder is equal to a whole garlic, so half a teaspoon would suffice. Ginger powder too can be substituted for fresh ginger. One teaspoon of dry ginger powder mixed with ¼ cup of water is equal to 2 teaspoons of fresh ginger paste, so half a teaspoon of ginger powder would be equal to 1 teaspoon of fresh ginger paste. A good curry depends on the right ingredients and the time taken to fry the onions and other ingredients which give it depth and body. The onions should be chopped or diced finely. This will ensure that the onions will fry evenly and create a base for the curry by combining the flavours of all the other ingredients. Take care however, not to burn the onions and garlic while frying or the curry would taste unpleasant. While using dry spice powders, always mix them together with a little water before adding them to fried onions. This spice mixture should be fried on low heat for at least 3 or 4 minutes, to eliminate their raw taste. The delightful aroma will let you know when the spices are fried enough. 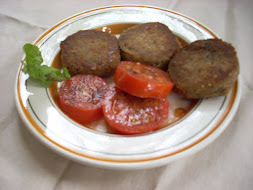 If the spice mix looks dry and starts to burn, add a little more water or chopped tomatoes if the recipe calls for it. When the oil starts to separate from the mixture you could add the meat and fry it in this spice mix for five to ten minutes. This helps seal the meat slightly and retain its moisture. Care should be taken to cook fresh and tender meat whenever possible. 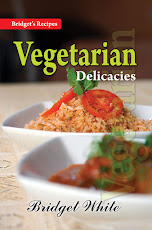 If the meat is marinated or mixed with the curry stuff or curry powder for some time before cooking, it not only locks in the flavours and juices but also helps to tenderize the meat so that cooking time is reduced considerably. Any good cooking oil could be used in the preparation of Anglo-Indian dishes such as Sun flower Oil, groundnut Oil or even Olive Oil depending on one’s preference. Use only White Non-Fruit Vinegar or Malt Vinegar in the dishes calling for Vinegar as fruit based vinegars could change the taste of the dish. Avoid random garnishing of every dish with chopped coriander / cilantro / celery as these ingredients change the flavour and taste of a dish. Garnish only if the recipe says to do so. 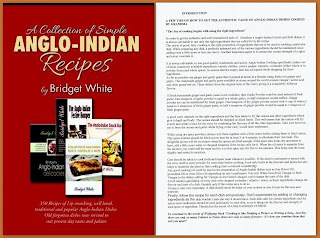 Bridget White-Kumar is a Cookery Book Author, Food Consultant and Culinary Historian. 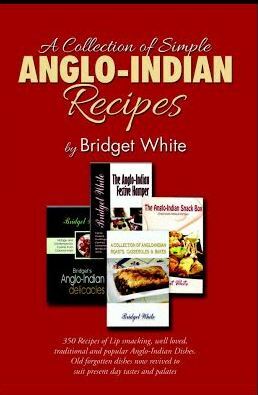 She has authored 7 Recipe books on Anglo-Indian Cuisine. Her area of expertise is in Colonial Anglo-Indian Food and she has gone through a lot of effort in reviving the old forgotten dishes of the Colonial British Raj Era. 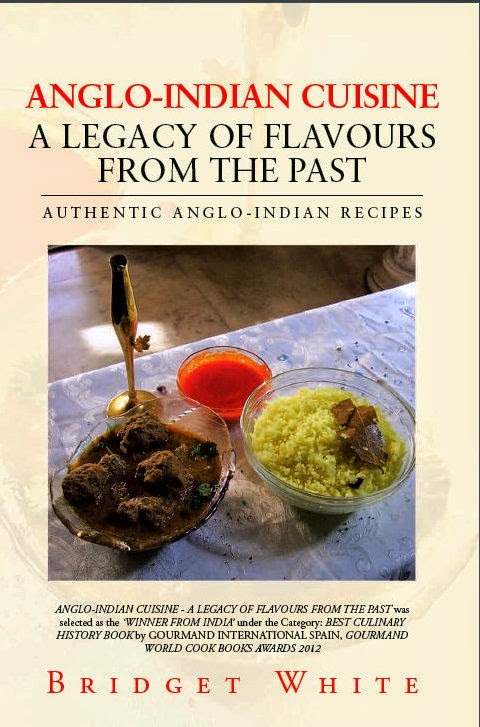 Her 7 Recipe books are a means of preserving for posterity, the very authentic tastes and flavours of Colonial ‘Anglo’ India, besides recording for future generations, the unique heritage of the pioneers of Anglo-Indian Cuisine. 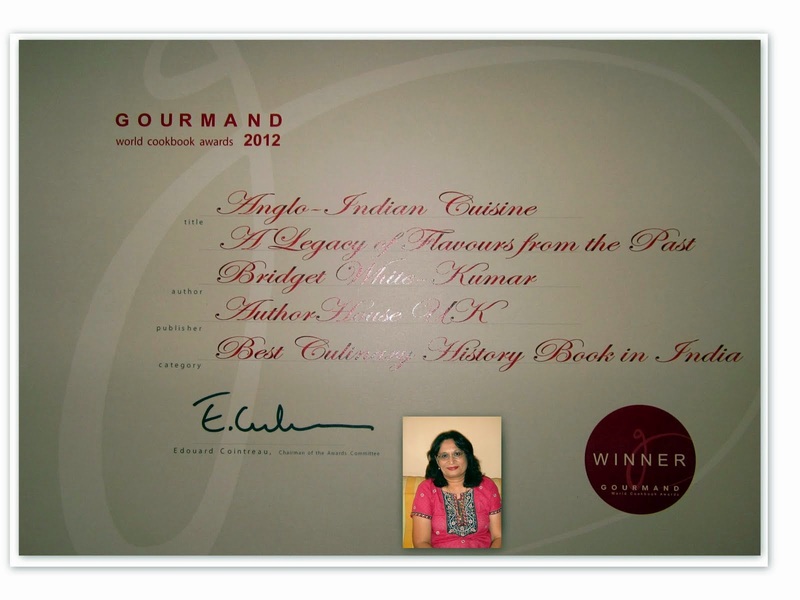 Her Recipe book ANGLO-INDIAN CUISINE – A LEGACY OF FLAVOURS FROM THE PAST was selected as ‘Winner from India’ Under the Category: ‘BEST CULINARY HISTORY BOOK IN INDIA by GOURMAND INTERNATIONAL SPAIN, GOURMAND WORLD COOK BOOKS AWARDS 2012. 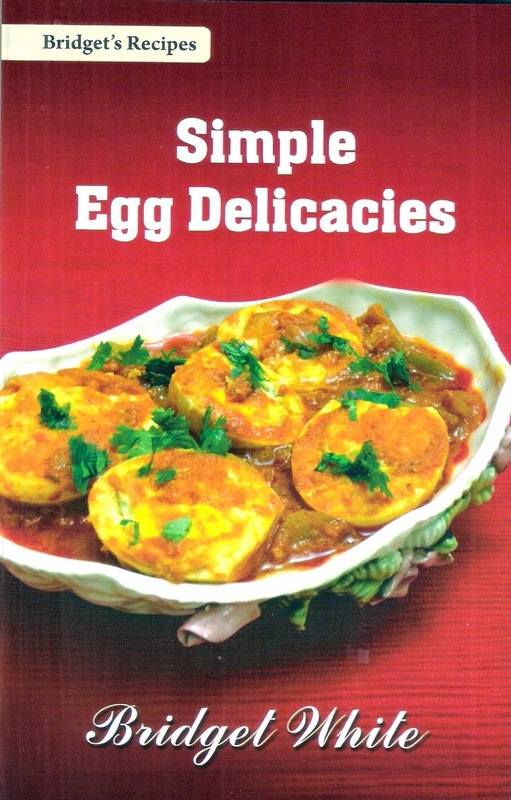 This prestigious Award is ‘THE OSCARS’ for Cook Book Writers. Awards are given every year for various categories and genres ie for Cook Book Authors, Cook Books, Chefs, Wine makers, etc selected from all over the World and she won this award in 2012. 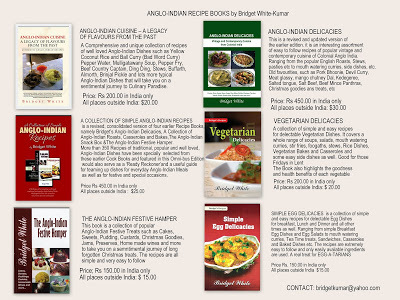 Being an Independent Freelance Consultant on Colonial Anglo-Indian Cuisine, Bridget has assisted many Restaurants, Hotels and Clubs in Bangalore and elsewhere with her knowledge of Colonial Anglo-Indian Food besides helping them to revamp and reinvent their Menus by introducing new dishes which are a combination of both Continental and Anglo-Indian. 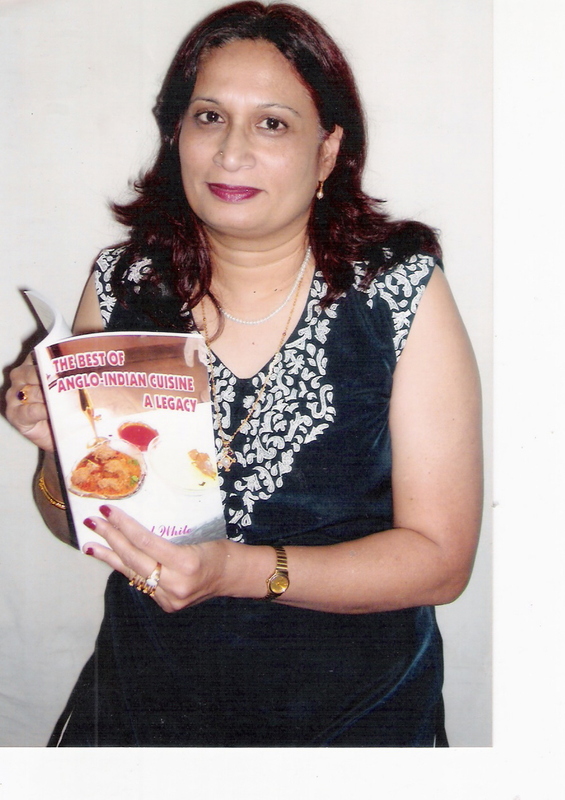 Many of them are now following the Recipes and guidance given by her and the dishes are enjoyed by both Indian and Foreign Guests. 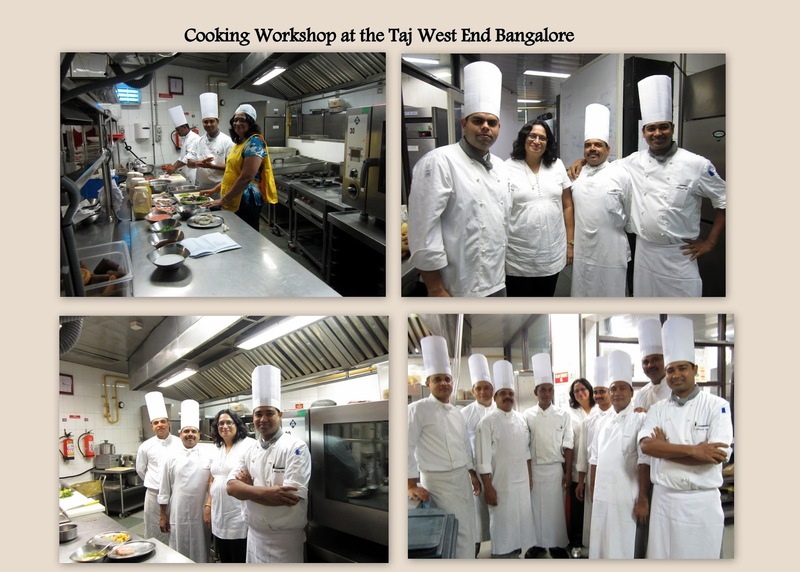 She has conducted Cooking Workshops and Training Sessions on Colonial Cuisine of the British Raj, for the staff at The Oberoi Mumbai, Sujan Luxury Rajmahal Palace Jaipur and Sher Bagh Ranthambore, The Bangalore Club, The Taj Conemara Chennai, The Taj West End Bangalore, Vivanta by Taj Whitefield, Cochrane Place Kurseong Darjeeling, Bow barracks Bangalore, etc, etc., besides conducting and assisting at Cooking Demos and Anglo-Indian Food festivals at various places. 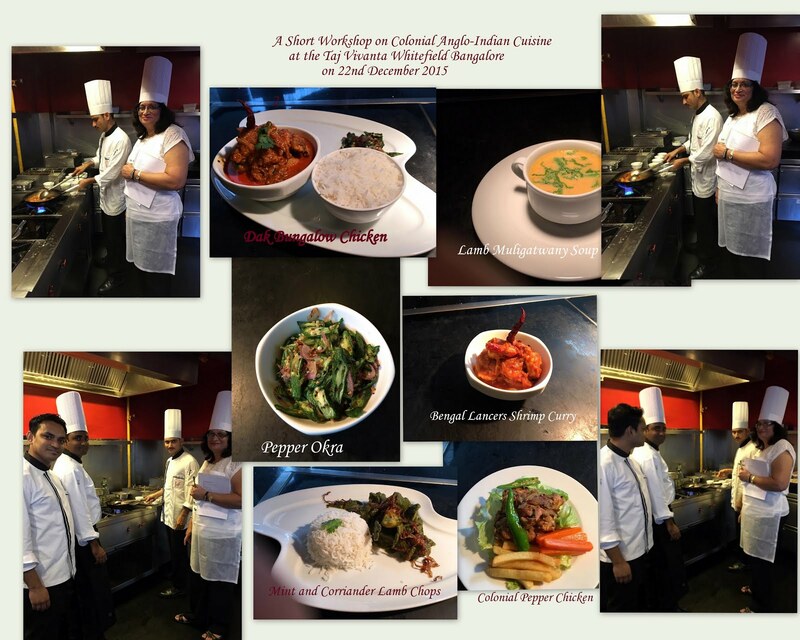 Bridget also conducts Cooking Classes and Demos on Anglo-Indian Cuisine in Bangalore and various places across the country such as Clubs, Restaurants, Women’s Groups, Corporate Offices, etc. Her One-of-a-kind Interactive and Hands on Culinary Training Workshops in Bangalore where participants learn the fine art of preparing delicious Colonial Anglo-Indian Dishes have been very well received and attended. She is always ready to share and talk about Recipes and Food. These are the books authored by her. 3. A Collection of Anglo-Indian Roasts, Casseroles and Bakes. 4. The Anglo-Indian Festive Hamper. 5. The Anglo-Indian Snack Box. 9. Kolar Gold Fields Down Memory Lane.